As a Magic: The Gathering columnist, what do you think is the question I'm asked more often than any others? What deck should I play next weekend? And just as often as I'm asked, I'm left wishing that I could offer some kind of simple and helpful answer. The fact is that choosing a deck is a very complicated and challenging issue. It's the one that we Magic players agonize over the most—the one that keeps us awake at night. Although we certainly won't find an easy answer, let's explore the question of how to choose your deck for a Magic tournament. Among certain groups, there can be a bit of a stigma against "netdecking" (copying your decklist from the internet). Among a small circle of friends, it's okay to establish whatever play guidelines you like. However, once you venture into the world of tournament Magic, netdecking is the norm and you should be prepared to face, if not embrace, it. If anything, building your own deck from scratch can be considered admirable, but netdecking should not be looked down upon. There are many advantages to copying a tournament-winning decklist. Perhaps most obviously, you're guaranteed to be playing a deck that's tried-and-true, which has already had good tournament results. Equally important, when you pick up a popular archetype from the internet, you're getting the benefit of thousands and thousands of players' hard work. Take, for example, Mono-red Aggro in Standard. A countless number of players play Mono-red, and incorporate their own instincts, experiences, and opinions into their decklists. They play the number of lands that they feel is correct, they structure their deck in the way they think will give them the best chance of winning, and they sideboard the cards they predict to be the most helpful. There's no guarantee that any one individual will be exactly correct, but over time, the better versions of the deck will win more, and their characteristics will be incorporated into future versions of Mono-red. It's Charles Darwin's theory of survival of the fittest! When you choose an archetype from the internet, you also save yourself a lot of time and energy that can now go into other aspects of your tournament preparation. If you've already decided on mono-red, now you can put all of your efforts toward tuning your decklist and practicing your game play. Building a deck from scratch is an extremely challenging endeavor. Even among world-class Magic players, there's only a select few who even attempt it, let alone ones that could be considered "masters." There's a common saying that for every one good deck idea, there are nine bad ones. It takes a ton of creativity, intuition, persistence, hard work, and discipline to succeed against such odds. Generally speaking, you'll be at a disadvantage when you try to build your own deck. But that absolutely does not mean you shouldn't try! For one thing, when you succeed in building a good deck from scratch, you can realize a great advantage over the field. You'll have a deck that no one is expecting and no one has prepared for. They won't know what cards you're likely to throw at them. More importantly, deck building is one of the best ways to learn and grow as a player. When you're in charge of everything from deck building to game play, you develop a deeper understanding of exactly what's going on in your games, and what's causing you to win and lose. Don't feel obligated to always build your own decks, especially when the time you can devote to preparation is limited. However, deck building is tremendously helpful and rewarding, and I encourage everyone to give it a try at least once in a while. Last week, I covered the concept of the metagame, and in particular what cards and decks you expect your opponents to be using. If you can accurately predict the metagame, you might be able to build, choose, or adjust a deck in order to make yourself razor-sharp against the decks you're most likely to face. When Blue-Black Control is the most popular deck, it's great to enter a tournament ready to jump for joy whenever your opponent leads off with a first turn Temple of Deceit. Sometimes, when you're specifically gunning for certain decks and those decks aren't specifically gunning for you, you can turn it into a huge advantage. Just remember that there's a lot of uncertainty in predicting the metagame. Often, the field is going to be quite diverse. Often, you're going to be mistaken (at least a little) about what other players are going to show up with. Even when you can accurately predict things to a tee, there's still no way to predict exactly which individuals you're going to be paired against in the tournament. If you want to be at the mercy of your opponents as little as possible, you might want to choose a deck with raw power. "Power" is a bit of a nebulous term in Magic, but it refers to how good a deck (or card) is without the context of format and metagame. I like to think about the power level of a deck as, "how well would this deck perform (relative to my other options) against an infinitely large sample of different opponents playing different decks from different formats?" Green Devotion, for example, has a lot of raw power. It's fast and explosive and, left to its own devices, it will outclass most things that other players will be doing. 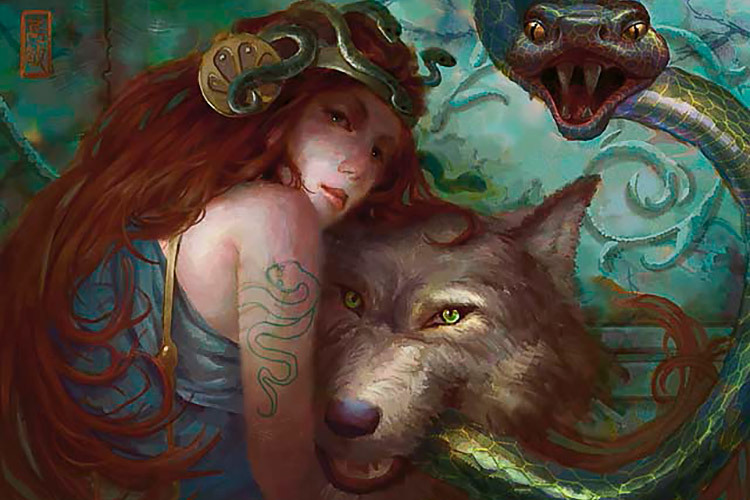 However, Green Devotion can sometimes be a bad metagame choice if too many people are playing with cards like End Hostilities, Crux of Fate, and Perilous Vault. Sometimes the circumstances are right to make a metagame choice, and other times it's best to default to a deck with a lot of raw power. Finding an intersection of both is ideal. Recall that being proactive means working toward a powerful goal of your own instead of simply reacting to what your opponent is doing. The best example of being proactive is simply playing an aggressive strategy, and trying to win the game as quickly as possible! With how diverse and uncertain Magic tournaments can be, there's a huge advantage to focusing on your own game plan, and knowing that if you can succeed in executing it, you're likely to win. It's more difficult to have answers for everything your opponents might have. The longer the games go, the more you open yourself up to things going wrong. I advocate having a proactive game plan, even in decks that are otherwise slower and more controlling. Dragonlord Ojutai is a great example of a proactive card for a control deck. It helps you leverage a small advantage into something insurmountable, and can close a game fast once you're ready to do so. On the other hand, inevitability is also valuable. You have inevitability if you're virtually guaranteed to win the game if things drag on indefinitely. When you have inevitability, all you need to do is survive in order to win the game. Often, defending yourself is easier than actually having to put your opponent away. The most dangerous scenario, however, is to believe that you have inevitability when you really don't. This is why a proactive game plan is important, because you want the ability to go for a win if something unexpected happens. Esper Dragons is a successful deck in Standard because it has inevitability over most of the format's other popular decks. Also, despite being a slower deck, it has a healthy proactive game plan in its ability to simply dominate the board with Dragons. A common pitfall of new Constructed players is undervaluing the sideboard. It's easy to get excited about a deck like Mono-Red because its win rate is so high in Game 1, before the sideboard gets involved. However, you don't really see the full picture until you begin to play games where the Abzan and Esper players are allowed to stock their decks full of Drown in Sorrows and Pharika's Cures. How your deck fares in the sideboarded games can be a major selling point. Midrange decks historically benefit the most from sideboarding. Because they're well rounded, they have maximum flexibility in what they can sideboard, and yet are difficult for opponents to attack. In general, the more extreme your strategy (suicidal aggro, control decks that lack proactive game plans, and linear strategies), the easier you will be to sideboard against. Do You Enjoy the Deck? This may seem like a strange factor to bring up in a dedicated strategy column, but I absolutely do believe that it can impact your tournament results. When you're having fun, and when you're passionate about a deck, you're going to perform better. If you force yourself to play a deck that you hate, or have little faith in, that will show as well. With a deck that you enjoy, it's easier to focus, and natural to spend more time thinking about the deck. Consequently, you're more likely to have an inspired idea for a change to the main deck, or a new sideboard card. On the flip side, when you don't enjoy playing with your deck, you can feel helpless and stagnant. You won't look for ways to improve the deck, and might make bad mulligan or game play decisions because you simply don't have faith that the deck is capable of something more. That brings us to what I believe to be the single most important factor in choosing a deck: how well can you play the deck? This will inevitably be closely tied to how much you enjoy the deck, but there's more than just that. Have you played the deck in previous tournaments? Have you done well? How much have you practiced? Have you played similar decks in other formats in the past? How well you pilot your deck of choice is usually more important than which deck you choose. I'd rather play a weaker deck well than play a stronger deck poorly. I believe that one of the biggest secrets to success in Constructed Magic is sticking with the same deck through multiple tournaments. You begin to learn the deck more intimately; you play better; you develop a deeper understanding of why you're winning and losing games; you sideboard better; you become better qualified to change cards and improve the deck. You can accomplish a lot of this through practicing at home, but there's really no substitute for testing yourself in tournament conditions against a variety of opponents. As important as predicting the metagame is, it's also crucial to prepare for the unexpected. When you master your deck, you'll be faster to adapt, and will know what to do even when you play against a deck you've never faced before. Most importantly, just like building a deck from scratch, truly mastering a deck is one of the best learning opportunities you can find. Developing a very deep understanding of a single deck will teach you lessons that you'll carry with you to other decks and formats. Over the years, the periods of greatest success and greatest growth in my career were the ones where I was able to stick with the same deck through a long series of tournaments. I encourage you, unless you find a fatal flaw in the deck you've been playing, to err on the side of sticking to one rather than switching back and forth. You don't need to have the absolute best deck in order to do well in a tournament. However, you do need to choose one that will allow you to realize your potential as a player. Think hard about your decision, and then dive in with both feet and don't look back. And as always, be sure to have fun with it!